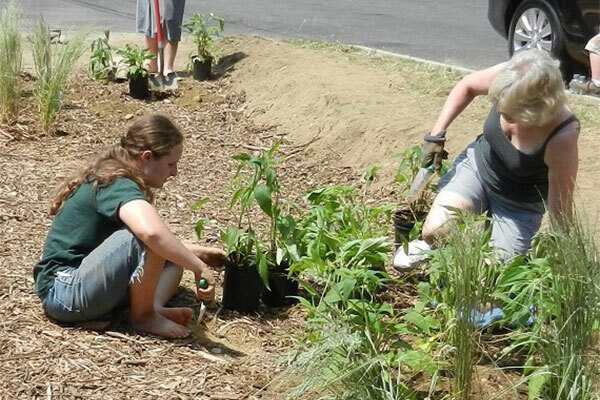 In June, after months of planning and research, volunteers from the Black River Action Team installed a rain garden on the front lawn of #11 Meadow Drive in the Pedden Acres neighborhood in Springfield. The homeowner, Meg, has experienced "ponding" of rain water and snow-melt at the foot of her driveway, and the goal of this new rain garden is to help such excess water infiltrate back into the ground -- keeping the water table at a healthy level for her lawn, prolonging the life of her driveway, and preventing some road salts and car wastes from entering the new street storm drains and ultimately the Black River. The garden features a variety of native wildflowers and grasses, including bee balm, Joe Pye weed, and coneflower. Meg hopes butterflies and other pollinators will be attracted to the blooms, which will add beauty to her "lawnscape." The garden will fill in as the plants spread out and multiply, reducing the need for weeding in subsequent years. The wildflowers were purchased from Morning Star Perennials of Bellows Falls and the grasses from Woodbury Florist of Springfield. An innovative grid material was installed at the entry-point of the garden, where the water will flow from the driveway into the planted area; the grid was supplied and installed by EJ Prescott of Concord, NH. Mulch and compost were provided and delivered by the Town of Springfield, and all labor was volunteered by the Black River Action Team as well as by Meg and her family, Moira Stettner, and neighbors Ariel Day and Cathy Caraffa (with her two small grandsons). Jan Lambert of the Valley Green Journal was on hand multiple days to assist with digging, as well as to record the progress of the garden for including in the recent edition of the Journal. The Meadow Drive rain garden was funded by a grant from the New England Grassroots Environmental Fund, and administered by the BRAT's fiscal agent, the Ottauquechee Natural Resources Conservation District. The garden is part of an ongoing, long-term campaign by the BRAT to teach the value of managing storm water on private property; a rain barrel workshop and a Storm Water Expo were held earlier in 2016 with the assistance of a grant from the Vermont Community Foundation. The rain garden is to be featured in more public outreach efforts by BRAT, including a PSA spot being edited for local-access television and a site visit in September by members of the CT River Joint Commissions. Photo by Jan Lambert: Volunteers and neighbors help plant the Meadow Drive rain garden; volunteers L to R: Moira Stettner, David Stern, Cathy Karaffa.